I am moved and embarrassed by this honor bestowed by the Parliament of the Republic of Lithuania on a Pole – a Polish journalist and editor of “Gazeta Wyborcza.” I treat it as a sign of recognition for my friends and colleagues who supported Lithuanian strivings for independence and democracy from the very beginning – and this includes people from the era of democratic opposition and those who later came together around “Gazeta.” Polish democratic opposition always wanted a sovereign and democratic Lithuania to be a friendly neighbor of a sovereign and democratic Poland. Czesław Miłosz was the teacher who taught Poles to think this way. He was a native of the Vilnius region, a Pole and a Lithuanian, a great poet who saw himself as heir of the Grand Duchy of Lithuania – a realm of diverse nationalities, languages, religions, and cultures. At that time, this Polish poet was perhaps the only person whose voice could reach the whole world – and it was a voice defending Lithuania, Latvia, and Estonia. Like many in my generation, I internalized this image of Vilnius. And that is also why I am so greatly moved today. And since I do not want Putin to come to either Vilnius or Warsaw to defend Russian-speakers, I am speaking in Polish today. I will be glad to speak Russian in Moscow once it’s free from Putin. Our wider context today is very sad. We just experienced the shock of the criminal terrorist attack on the editorial office of the satirical journal “Charlie Hebdo.” This is what happens when the peaceful tradition of Islam is transformed into a political ideology of murder and fanaticism. It is a lesson for us all – no one offends God more profoundly than he evokes God’s name as he resorts to lies, hatred, and murder weapons. We are observing a different dimension of terrorism, hatred, and lies in eastern Ukraine. We are well familiar with the language of propaganda and Putinist procedures; it is the language of Hitler and Goebbels, the language of Stalin and prosecutor Wyszyński. It is the language and procedures of lies, hatred, and aggression. Ukraine cannot become a realm of aggression and an object of trade. Ukraine has the right to independence and democracy – just like Lithuania and Poland. Our nations understand this very well. And this is all the more reason to keep repeating that Putin is not Russia, that Putin is great-Russian imperialism. We will always remember another Russia, the Russia of Herzen and Sakharov. In the mid-nineteenth century, Herzen said that Lithuania must be able to make decisions about its own future, and later Sakharov stubbornly demanded that the Soviet empire undertake decolonization. In different ways, both Poland and Lithuania were enslaved by the Soviet dictatorship. During that time, things that united us were stronger than those that divided us. We should remember our old feuds – and our entire history – and talk about it honestly. We cannot change the past; we can only think it through and work through it. Vilnius, the capital of sovereign and democratic Lithuania will forever remain an irremovable element of Polish historical memory. To acknowledge as much, however, is also to renounce – forever – any inclinations toward the revision of borders. Since 1989, this is the position of the Polish state and Polish public opinion. Let us think for a moment: what a great gift we offer to the great-Russian “Black Hundreds” when there are Polish-Lithuanian conflicts around the spelling of last names or bilingual street names in cities inhabited by many Poles – Lithuanian citizens. Jerzy Giedroyc, an eminent Pole and Lithuanian who shaped Polish political thought, was able to think in categories that were ahead of his time. He believed that Poland’s and Lithuania’s independence posed a crucially important task before the elites of both nations. The creation of a sound partnership between our nations is an obvious demand of our time and geopolitics. And this is why every Lithuanian who is a citizen of the Republic of Poland, and every Pole who is a citizen of the Republic of Lithuania, should enjoy the full range of civil rights. Let this be our joint contribution to the legacy of the European Union. Whoever impedes this – whether because he lacks imagination or gets intoxicated by ethnic chauvinism – works against the national interest of each of our countries. The most distinguished Poles – Adam Mickiewicz and Czesław Miłosz, Leszek Kołakowski and Tadeusz Konwicki, and especially Karol Wojtyła, Pope John Paul II – shared this view. And I am a Pole, a Polish intellectual. I am responsible for Polish shortcomings. And so I first note – and I repeat this often – that there is a guilt multiplier principle. There are ten times as many Poles as there are Lithuanians, and so in Polish-Lithuanian relations, every Polish fault is ten times greater. As I see it, Polish collective consciousness is blemished by ignorance and lack of sensitivity to wounded Lithuanian memory. Fortunately, things are changing for the better and I believe that changes will continue to unfold. Tadeusz Konwicki, a great Polish writer who recently passed away, wrote about the 1863 Uprising in Lithuania, and used the fate of his protagonist, Colonel Zygmunt Mineyko, to ask: “Was it worth it?” He replied with the words of Romuald Traugutt, the rebellion’s last leader: “I don’t know if it made sense to do it, but I know we had to do it.” This compulsion accompanied Poles and Lithuanians through the long years of enslavement. But this compulsion is what led us to freedom. To conclude, let me raise a Georgian toast. There once was a shepherd with a herd of sheep. An eagle flew down, snatched a sheep and flew away. So the shepherd took his rifle and shot at the eagle. Here’s to no sheep flying up to the sky, and no shooting at eagles. 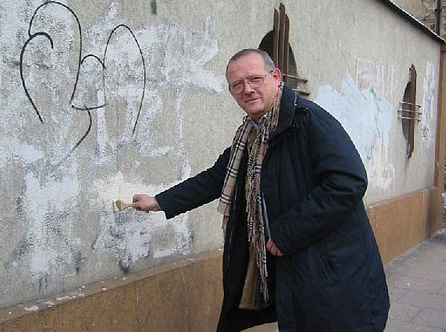 Adam Michnik received the Freedom Prize from the Lithuanian Parliament on January 13th, 2015 – in Lithuania, January 13th is Freedom Defenders’ Day and commemorates those killed in the Soviet attack on the Vilnius TV tower on January 13th, 1991. The Lithuanian Parliament established the Freedom Prize in 2011. It is given to individuals and organizations who have distinguished themselves in the fight for freedom and human rights, and for the sovereignty of nations in East Central Europe. This is a translation of Adam Michnik’s talk as published in Polish in Gazeta Wyborcza, nr 19, January 24, 2015, p. 29. Translated by Agnieszka Marczyk.